The first part of the collection, Impressions et poésies, is by far the most important, and was deliberately designed to be so. In his rather florid preface, Liszt indicated that the subsequent parts would be filled with lighter folk material (although, at that stage, he envisaged that material as representing a great many countries) and that the poetic ideal to which he aspired was for the enjoyment of the few rather than the many. The set begins with a piece composed in 1834, inspired by a workers’ uprising in Lyon, dedicated to Liszt’s mentor, the Abbé Félicité de Lammenais, and prefaced with the workers’ slogan: ‘Vivre en travaillant ou mourir en combattant’ (‘Live working or die fighting’). Cast as a powerful, orchestral-sounding march, the work is very tightly constructed from an introductory fanfare figure and a more extended melody which share a martial dotted rhythm. The climax is particularly noteworthy for anticipating by some twenty years the sleep motif from the closing scene of Wagner’s Die Walküre. Most of the remaining music was composed in Geneva between 1835 and 1836. ‘Le Lac de Wallenstadt’ is very little different from its revised version, and similarly carries a quotation from Byron’s Childe Harold: ‘thy contrasted lake … warns me, with its stillness, to for sake / Earth’s troubled waters for a purer spring.’ A rhythmic ostinato of a triplet and two duplets accompanies the most innocent of melodies. With no change of key or subject matter, ‘Au bord d’une source’ follows immediately. The poem from Schiller describes the spring as the beginning of the play of young nature. It must be admitted that this first version of one of Liszt’s loveliest water pieces contains many technical complications which were more delicately resolved in the revision. ‘Les cloches de G*****’ (why did Liszt wish to conceal the name of Geneva?—at any rate, he revealed it in the revised version) is dedicated to Liszt’s baby daughter Blandine and is an extended nature poem. In the revised version Liszt retained only a brief portion of the work and added a new second section. In this original version, the work develops its material more fully, and a subsidiary theme, discarded in the second version, rises to a passionate climax before the evening calm is restored with filigree decoration. ‘Vallée d’Obermann’ was inspired by a novel by its dedicatee Senancourt rather than by any specific Swiss scene. Although the later version is generally regarded as one of Liszt’s finest works, the original, too, is full of interest. The thematic material is broadly the same, and some of the structure is similar, but other events are distributed in a different order and several passages take on an unfamiliar harmonic hue. Liszt quotes a very lengthy piece of the novel describing the character of alpine scenery and folk music. Although this particular piece contains only original themes, many of the later pieces might be embraced by the same preface. ‘La chapelle de Guillaume Tell’ certainly contains the call of an alpenhorn, but its main theme was taken over from an unpublished and discarded ‘Grand solo caractéristique d’apropos une chansonette de Panséron’, the manuscript of which was sighted at an auction at Sotheby’s in London in 1987, but whose present whereabouts are unknown. The later version, which shares the grandeur of the first, dispenses with the horn call, but has then to do without the excellent coda which derives from it. The first book comes to a simple conclusion with ‘Psaume—de l’église à Génève’—an elaboration of a melody by Louis Bourgeois (c1510–c1561) prefaced with the opening of Psalm 42: ‘Comme un cerf brame après des eaux courantes …’ (‘As the hart panteth after the water-brooks …’). Like ‘Lyon’, this piece was excluded from the revised collection. The disarming simplicity of the nine pieces entitled Fleurs mélodiques des Alpes is often contradicted by deceptively difficult piano-writing, which may explain their almost total neglect—for there is much here that deserves a more frequent hearing. (Only two of these pieces were preserved for the Années de pèlerinage.) As so often with Liszt, there is no fine line drawn between an anonymous folk melody and a theme borrowed from a popular art song of the day, and these pieces seem all to be based on external sources, only some of which have been identified—as folk songs, horn calls and the like, and Nos 5 and 8 are based on melodies by Huber. The first group of three begins with a piece in simple ternary form, but the second is a complex kaleidoscope of melodies, later revised and combined with the second theme of the Fantaisie romantique to form Le mal du pays (Nostalgia), while the third became Pastorale in its less rhythmically daring revision. The opening number of the second group starts with a horn call and a simple melody, but the fast middle section is a mysterious march with distinctly Hungarian overtones. Then follow a piece heavily relying upon the tremolo for a rather operatic effect and another folk-song medley which for some reason contains a polonaise. The third group opens with a martial Allegretto which alternates with more fragile themes in triple time. The penultimate piece derives entirely from a horn call. The last piece is perhaps the most interesting: if some of the material is Swiss, a lot of the atmosphere is Hungarian, and some of the raw harmony brings to mind the Liszt of almost half a century later. The three paraphrases which make up the third book were actually issued separately before the collection was finally put into shape for publication at the end of the 1830s. 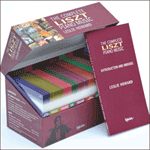 The text followed here is that of the Liszt-Stiftung, which represents Liszt’s final thoughts (on these first versions: the 1877 revisions, Trois Morceaux suisses, will be recorded elsewhere). Except that the themes derive from Swiss art songs by forgotten minor composers—Ferdinand Huber (1791–1863) and Ernest Knop (d1850), the style and construction of the set bears comparison with some of the longer operatic fantasies. There is a certain amount of confusion over the titles of these pieces, which went through several editions, each of which made its own changes; the titles given here conform to Haslinger’s first edition of the complete Album d’un voyageur. The catalogue in Grove’s Dictionary makes a curious mish-mash of several variants, the revised versions have revised titles, and the London edition even called the pieces ‘Zürich’, ‘Berne’ and ‘Lucerne’! When the pieces were published separately as Opus 10, the titles were: ‘Improvisata sur le ranz de vaches: Départ pour les Alpes (Aufzug auf die Alp) [which should read ‘Alpen’ here and elsewhere] de Ferd Huber’; ‘Nocturne sur le “Chant montagnard” (Bergliedchen) d’Ernest Knop’; and ‘Rondeau sur le “Ranz de chèvre” (Giessreihen) de Ferd Huber’. In the ‘Ranz de vaches’, the opening fanfare becomes a melody subjected to much variation, and interspersed with two other melodies and their variants, the one in a martial 2/4, the other in a frenetic 6/8—by now a long way removed from the cattle-call of the title. ‘Un soir dans les montagnes’ is a beautifully developed song interrupted by a colossal storm, which invokes all the musical tricks of the day (especially reminiscent of the then brand new Rossini opera Guillaume Tell) before the opening music returns. Like the first paraphrase, the third submits a simple motif to great variation, and, although goats may well move faster than cattle, their call is pushed to the very extreme of musical velocity. La première partie du recueil, Impressions et poésies, est de loin la plus importante, et était délibérément conçue ainsi. Dans sa préface au style plutôt fleuri, Liszt indique que les parties suivantes feraient appel à des sources légères, tirées du folklore (bien qu’à ce stade il ait envisagé que ces éléments proviennent d’un grand nombre de pays) et que l’idéal poétique auquel il aspirait ne serait apprécié que par un petit nombre. L’ensemble commence par un morceau composé en 1834, inspiré par un soulèvement des travailleurs de Lyon, dédicacé au mentor de Liszt, l’Abbé Félicité de Lammenais, avec en préface le slogan des ouvriers: «Vivre en travaillant ou mourir en combattant». Sous la forme d’une marche puissante, aux résonnances d’orchestre, le morceau est construit avec rigueur en partant d’une fanfare en introduction qui s’élargit en une mélodie avec laquelle elle partage un rythme martial. L’apothéose est tout-à-fait remarquable car elle anticipe de près de vingt ans le motif du sommeil de la scène finale de Die Walküre de Wagner. Le reste de la musique, pour la plupart, a été composé à Genève entre 1835 et 1836. «Le lac de Wallenstadt» ne diffère guère de la dernière version, et de la même façon commence avec une citation de Byron tirée de Childe Harold: «Thy contrasted lake … warns me, with its stillness, to forsake / Earth troubled waters for a purer spring» («Ton lac contrasté … me conseille, par son calme, d’abandonner / Les eaux turbulentes de la terre pour une source plus pure»). Un ostinato rythmique d’un triolet et de deux duolets accompagne une mélodie des plus innocentes. Sans changement de clé ni de sujet, elle est suivie immédiatement par «Au bord d’une source». Le poème de Schiller décrit la source au début du jeu de la toute jeune nature. Il faut reconnaître que cette première version de l’un des morceaux de water music les plus charmants de Liszt contient beaucoup de complications techniques qui ont été résolues de façon plus subtile dans la version révisée. «Les cloches de G*****» (Pourquoi Liszt avait-il souhaité cacher le nom de Genève? En tout cas, il l’a révélé dans la dernière version), dédicacé à Blandine, sa toute petite fille, est un poème plus large sur la nature. Dans la version révisée, Liszt n’a conservé qu’une brève section du morceau et lui en a ajouté une deuxième, nouvelle. Dans notre version originale, l’œuvre se développe plus complètement et un thème accessoire, écarté dans la dernière version, atteint un apogée passionné avant que le calme du soir ne soit restauré avec une décoration en filigrane. «Vallée d’Oberman» est une œuvre inspirée par un roman écrit par celui auquel elle est dédicacée, plutôt que par un lieu suisse particulier. Bien que la dernière version soit généralement considérée comme l’une des plus belles œuvres de Liszt, l’original est lui aussi digne d’intérêt. Le matériel thématique est plus ou moins le même, et une partie de la structure est semblable, mais d’autres événements prennent place dans un ordre différent, et plusieurs passages ont une coloration harmonique inhabituelle. Liszt cite un très long passage du roman qui décrit le caractère de la scène alpine et de la musique folklorique. Bien que ce morceau particulier contienne seulement des thèmes originaux, la même préface pourrait s’appliquer à bon nombre des autres qui suivent. «La chapelle de Guillaume Tell» contient sans aucun doute le son d’un cor alpin, mais son thème principal a pour origine un certain «Grand solo caractéristique d’apropos une chansonette de Panséron», dont le manuscrit a été aperçu à une vente aux enchères de Sotheby à Londres en 1987, pour disparaître ensuite. La dernière version, qui partage avec la première une certaine grandeur, s’est débarrassée du cor alpin, et doit donc se passer de l’excellent coda qui en provenait. Le premier tome conclut simplement avec le «Psaume de l’église à Genève», élaboration d’une mélodie de Louis Bourgeois (ap.1510–1561) avec en préface le début du psaume 42: «Comme un cerf brame après des eaux courantes …». Comme pour «Lyon», ce morceau avait été exclu de la dernière version. La simplicité désarmante des neuf morceaux intitulés Fleurs mélodiques des Alpes est souvent contredite par une écriture pour piano qui donne l’illusion d’être difficile, ce qui pourrait expliquer qu’on les ait pratiquement complètement négligés, bien qu’on y trouve amplement qui vaille la peine d’être écouté plus souvent. (Seulement deux de ces morceaux ont été conservés dans les Années de pèlerinage.) Comme si souvent chez Liszt, on ne peut guère distinguer entre une mélodie folklorique anonyme et un thème emprunté à une chanson populaire du temps, et ces morceaux semblent tous provenir de sources extérieures, dont on n’a pu identifier qu’un nombre restreint, parmi lesquels les chansons folkloriques, appels de cor etc … et les Nos 5 et 8 qui viennent de mélodies composées par Huber. Le premier groupe de trois commence avec un morceau simplement ternaire, mais le deuxième est un kaleidoscope de mélodies, révisées plus tard et combinées avec le deuxième thème de la Fantaisie romantique pour former Le mal du pays (Nostalgia), alors que le troisième est devenu la Pastorale dans une version au rythme moins osé. L’ouverture du deuxième ensemble commence par le son du cor et une mélodie simple, mais la rapide section médiane est une marche mystérieuse avec des harmoniques hongroises à n’en pas douter. On trouve ensuite un morceau qui dépend lourdement du tremolo pour un effet plutôt d’opéra et un autre pot-pourri de chansons folkloriques qui pour on ne sait quelle raison inclut une polonaise. Le troisième ensemble commence avec un Allegretto martial qui alterne avec des thèmes plus délicats en trois temps. L’avant dernier morceau dérive entièrement d’un appel de cor. Le dernier est peut-être le plus intéressant; même si certains de ses éléments sont suisses, une bonne partie de l’atmosphère est hongroise, et certaines des harmonies brutes ne sont pas sans évoquer le Liszt de presque un demi siècle plus tard. Les trois paraphrases qui constituent le troisième volume ont d’abord apparu séparément avant que le recueil ne soit mis en forme pour être publié à la fin des années 1830. Le texte adopté ici est celui de Liszt-Stiftung (fonds d’archives) qui représente les dernières idées de Liszt (parmi les premières versions, on enregistrera ailleurs celle de Trois Morceaux suisses de 1877). 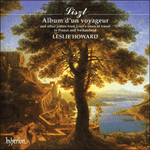 Mis à part le fait que les thèmes sont dérivés de chants suisses composés par des artistes mineurs (Ferdinand Huber, 1791–1863, et Ernest Knop (mort en 1850), le style et la construction de l’ensemble peuvent se comparer à certaines fantaisies d’opéra plus longues. Il existe une certaine confusion à l’égard des titres de ces morceaux qui ont connu plusieurs éditions, avec des changements à chaque occasion; le titre que nous avons retenu est conforme à la première édition de Haslinger de l’Album d’un voyageur au complet. Le catalogue dans le dictionnaire de Grove mélange de façon curieuse plusieurs variantes, les versions révisées portent les titres révisés, et l’édition londonienne a même appelé les morceaux «Zurich», «Berne» et «Lucerne»! Quand les morceaux ont été publiés séparément comme Opus 10, les titres en étaient: «Improvisata sur le ranz de vaches: Départ pour les Alpes (Aufzug auf die Alp) [qui devrait être, là comme ailleurs, ‘Alpen’]»; «Nocturne sur le ‘Chant montagnard’ (Bergliedchen) d’Ernest Knop»; et «Rondeau sur le ‘Ranz de chèvre’ (Giessreigen) de Fred Huber». Dans le «Ranz de vaches», la fanfare d’ouverture devient une mélodie sujette à beaucoup de variation, émaillée de deux autres mélodies et de leurs variantes, l’une dans un 2/4 martial, l’autre dans un 6/8 frénétique, à ce moment-là, bien éloigné de l’appel des bestiaux du titre. «Un soir dans les montagnes» est une chanson qui se développe à la perfection, interrompue par un orage colossal qui fait appel à toutes les astuces musicales de l’époque (non sans rappeler Guillaume Tell, l’opéra de Rossini, qui venait de sortir) avant le retour de la musique d’ouverture. Comme la première paraphrase, la troisième soumet un motif, en lui-même simple, à une grande variation, et bien que les chèvres puissent se déplacer plus vite que les vaches, leur appel n’en n’est pas moins poussé aux limites de la vélocité musicale. Der erste Teil der Sammlung, Impressions et poésies, ist zweifellos der wichtigste und war auch als solcher beabsichtigt. In seinem eher blumigen Vorwort deutete Liszt an, daß die folgenden Teile leichteres volkstümliches Material enthielten (obwohl er zu diesem Zeitpunkt vorhatte, daß das Material viele verschiedene Länder darstellen sollte) und daß das poetische Ideal, das er anstrebte, zur Belustigung der wenigen und nicht der Massen dienen sollte. Der Satz beginnt mit einem im Jahre 1834 geschriebenen Stück, das durch den Arbeiteraufstand in Lyon inspiriert und dem Mentor Liszts, Abbé Félicité de Lammenais gewidmet war und als Vorwort den Arbeiterruf „Vivre en travaillant ou mourir en combattant“ („In der Arbeit leben oder im Kampf sterben“) besaß. Als kraftvoller, orchestralklingender Marsch ist das Werk aus einer einleitenden Fanfarenfigur und einer erweiterten Melodie streng konstruiert, die den gleichen marschartig punktierten Rhythmus aufweisen. Der Höhepunkt ist besonders bemerkenswert, denn er sieht das Schlafmotiv der Schlußszene in Wagners Walküre um etwa zwanzig Jahre voraus. Die übrige Musik der Sammlung war großenteils zwischen 1835 und 1836 in Genf komponiert worden. „Le Lac de Wallenstadt“ unterscheidet sich nur geringfügig von der überarbeiteten Version und ist auch mit einem Zitat versehen, nämlich aus Byrons Childe Harold „thy contrasting lake … warns me, with its stillness, to forsake / Earth’s troubled waters for a purer spring“ („Dein gegensätzlicher See … warnt mich, mit seiner Stille, den trüben Wassern der Erde für eine reinere Quelle zu entsagen“). Ein rhythmisches Ostinato aus einer Triole und zwei Duolen begleitet die einfachste aller Melodien. Ohne Änderung der Tonlage oder des Themas schließt sich unmittelbar das „Au bord d’une source“ an. Das Gedicht Schillers beschreibt den Frühling als Spielbeginn der jungen Natur. Zugegeben, diese erste Version eines der schönsten Wasserstücke enthält eine Reihe technischer Schwierigkeiten, die in der Bearbeitung einfühlsamer behandelt wurden. „Les cloches de G*****“ (warum wollte Liszt den Namen der Stadt Genf verbergen?—in der überarbeiteten Version nannte er ihn doch) ist seinem Töchterchen Blandine gewidmet und ein erweitertes Naturgedicht. In der Bearbeitung behielt Liszt nur ein kurzes Stück des Werkes bei und ergänzte es mit einem neuen zweiten Teil. In dieser Originalversion wird das Material ausgiebiger entwickelt und ein untergeordnetes Thema, das in der zweiten Version nicht enthalten ist, schwillt zu einem feurigen Höhepunkt an, bevor mit einer filigranartigen Verzierung die Abendruhe wieder einzieht. Liszt erhielt seine Inspiration für „Vallée d’Obermann“ aus einem Roman des Schriftstellers Senancourt und nicht aus einem bestimmten Schweizer Schauplatz. Zwar wird die spätere Version im allgemeinen als eines der feinsten Werke Liszts angesehen, doch ist die ursprüngliche Form nicht weniger interessant. Das thematische Material ist ungefähr das gleiche und auch die Struktur ist ähnlich. Jedoch sind einige Ereignisse anders angeordnet und mehrere Passagen nehmen eine ungewohnte harmonische Färbung an. Liszt beschreibt in einem längeren Zitat aus dem Roman den Charakter der Alpenlandschaft und Volksmusik. Obwohl dieses Stück nur die ursprünglichen Themen enthält, könnte sich dasselbe Vorwort auch auf viele spätere Stücke beziehen. Zwar ertönt in „La Chapelle de Guillaume Tell“ wirklich der Ruf eines Alpenhorns, doch wurde das Hauptthema aus einem unveröffentlichten und verworfenen Grand solo caractéristique d’apropos une chansonette de Panséron übernommen, dessen Handschrift im Jahre 1987 bei einer Auktion von Sotheby’s in London auftauchte und deren Verbleib heute jedoch unbekannt ist. In der späteren Version mit der gleichen Großartigkeit der ersten wird auf das Alpenhorn verzichtet, besitzt daher also nicht den ausgezeichneten Coda, der daraus entstand. Der erste Band kommt mit „Psaume—de l’église à Génève“—eine Bearbeitung einer Melodie von Louis Bourgois (c1510–c1561) und dem Vorwort aus Psalm 42: „comme un cerf brame après des eaux courante …“ („Wie der Hirsch nach den Wasserquellen dürstet …“) zu einem schlichten Abschluß. Wie Lyon wurde auch dieses Stück nicht in die revidierte Sammlung aufgenommen. Die verblüffende Einfachheit der neun Stücke mit dem Titel Fleurs mélodiques des Alpes steht meist im Widerspruch zu der täuschenden technischen Schwierigkeit des Klavierspiels, was sicher auch die Ursache für die fast vollkommene Vernachlässigung dieser Stücke ist—doch besitzen sie genug an Material, das ein öfteres Anhören gerechtfertigt wäre. (Nur zwei dieser Stücke wurden für die Années de pèlerinage erhalten.) Wie so oft bei Liszt vorkommt, ist zwischen einer anonymen Volksmelodie und dem einem bekannten Kunstlied des Tages entnommenen Thema keine genaue Abgrenzung zu finden, und diese Stücke scheinen alle auf äußeren Quellen zu beruhen, von denen nur einige als Volkslied, Hornrufe und ähnliche identifiziert werden können—Nummern 5 und 8 stammen von Melodien von Huber. Die erste der drei Gruppen beginnt mit einem in einfacher dreiteiliger Form geschriebenen Stück, die zweite ist jedoch ein kompliziertes Kaleidoskop von Melodien, das später überarbeitet und mit dem zweiten Thema der Fantaisie romantique zum Le mal du pays (Nostalgie) verbunden wurde. Die dritte Gruppe wurde das Pastorale in einer rhythmisch weniger gewagten Überarbeitung. Die eröffnende Nummer der zweiten Gruppe beginnt mit einem Hornruf und einer schlichten Melodie, der schnelle mittlere Teil ist jedoch ein geheimnisvoller Marsch mit deutlich ungarischen Untertönen. Dann folgt ein für eine eher opernhafte Wirkung stark auf dem Tremolo beruhendes Stück und ein weiteres Volkslied-Potpourri, das aus irgendeinem Grund auch eine Polonaise enthält. Die dritte Gruppe wird mit einem marschartigen Allegretto eingeleitet, das sich mit zierlicheren Themen im Dreiertakt abwechselt. Das vorletzte Stück stammt ausschließlich von einem Hornruf ab, und das letzte ist vielleicht das interessanteste, denn während ein Teil des Materials schweizerischen Ursprungs ist, so ist die Stimmung doch hauptsächlich ungarisch, und einige der rohen Harmonien erinnern an den Liszt von fast einem halben Jahrhundert später. Die drei Paraphrasen, aus dem sich der dritte Band zusammensetzt, war zuerst separat herausgegeben worden, bevor die endgültige Fassung der Sammlung zur Veröffentlichung gegen Ende des Jahres 1830 festgelegt wurde. Hier wurde dem Text der Liszt-Stiftung nachgegangen, die die letzten Überlegungen Liszts wiedergeben (über diese ersten Versionen; die Bearbeitungen von 1877, Trois Morceaux suisses, sind an anderer Stelle aufgezeichnet). Mit Ausnahme der Tatsache, daß die Themen auf Schweizer Kunstliedern in Vergessenheit geratener, unbedeutender Komponisten wie Ferdinand Huber (1791–1863) und Ernest Knop (gest. 1850) beruhen, sind Stil und Struktur des Satzes mit einigen der längeren Opernfantasien vergleichbar. Über die Titel dieser Stücke bestehen einige Unklarheiten, denn sie wurden in verschiedenen Editionen herausgegeben, die alle ihre eigenen Änderungen durchführten. Die hier angegebenen Titel stimmen mit denen von Haslingers erster Edition des vollständigen Album d’un voyageur überein. Im Katalog von Groves Lexikon findet sich ein merkwürdiges Durcheinander der verschiedenen Versionen: die überarbeiteten Versionen besitzen überarbeitete Titel, und die Londoner Ausgabe bezeichnete die Stücke sogar als „Zürich“, „Bern“ und „Luzern“! Als die Stücke separat als Opus 10 herausgegeben wurden, besaßen sie die Titel „Improvisata sur le ranz de vaches: Départ pour les Alpes (Aufzug auf die Alp) [was hier und anderswo eigentlich „Alpen“ heißen müßte] de Ferd Huber“; „Nocturne sur le ‘Chant montagnard’ (Bergliedchen) d’Ernest Knop’; und „Rondeau sur le ‘Ranz de chèvre’ (Geißreigen) de Ferd Huber“. Im „Ranz de vaches“ verwandelt sich die Eröffnungsfanfare in eine viel veränderte Melodie, die von zwei weiteren Melodien und ihren Varianten, die eine im 2/4-Marschrhythmus, die andere im lebhaften 6/8-Takt, durchzogen ist—mittlerweile weit entfernt vom Viehruf des Titels. „Un soir dans les montagnes“ ist ein wunderschön ausgearbeitetes Lied, das von einem kolossalen Sturm unterbrochen wird, der alle musikalischen Kunstgriffe der Zeit einsetzte (besonders in Anklang an die damals nagelneue Rossini-Oper Wilhelm Tell), bevor die Eröffnungsmelodie wiederkehrt. Wie in der ersten Paraphrase wird auch in der dritten ein schlichtes Motiv großer Veränderungen unterzogen und, weil Geißen ja schneller als Kühe laufen können, wird ihr Ruf bis zu den äußersten Grenzen der musikalischen Geschwindigkeit getrieben.